Nov. 27, 2008–I was dipping back into a book by Carl M. Brauer, Presidential Transitions: Eisenhower through Reagan (Oxford University Press, 1986) and found much information that might be useful to the Obama transition. The last chapter, "Conclusions: Historical Patterns and Lessons," concentrates all the book's earlier stories and comparisons into a dense guide for any transition staff that has time to look up from the resumes they are reviewing. Relations between outgoing and incoming Presidential administrations have usually been civil... but rarely productive or educational (p. 258). 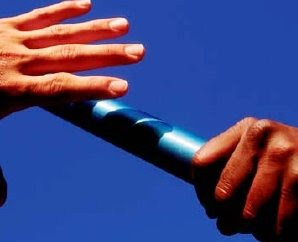 A common experience is for outgoing staff to prepare themselves for a debriefing, never to be asked for it. I know that in New York City many a briefing book for the next administration has been unopened. frequently overreact to a perceived flaw in their predecessor. In reaction to Truman, Eisenhower was too anti-political. In reaction to Eisenhower, Kennedy was too anti-organizational. In reaction to Nixon, Carter was too "anti-imperial." In reaction to Carter, Reagan was too ideological. new Presidents and those around them, buoyed by their recent electoral victory, tend to believe that bad things cannot happen to them. But bad things do happen. Some Presidents are reelected, but all Presidents leave office with significant amounts of scar tissue... [A]ll Presidents have made decisions at the start of their administrations that they later regarded as serious mistakes or should have so regarded (p. 258). Brauer believes that Presidents need to damp down "excessive optimism" and too much faith in the potential from "organizational reform". Read the stunning new book from the Center for Defense Information (CDI) on the budgeting weaknesses and strategic blunders of the DoD. It's a remarkably good read as well as offering a buffet of common-sense reforms for the new President and Congress. Rep. Barney Frank has already called for a 25 percent cut in the military budget. That may be hard to do right away because of the overstretched troops in Iraq and Afghanistan, but the new book shows lots of ways that the out-of-control military budget can be reined in for more security at less cost. The book, America's Defense Meltdown: Pentagon Reform for President Obama and the New Congress, is out just two weeks after the election, exemplifying one of the themes that runs through it, namely the importance of speed and the ponderous nature of our military organization, which is critiqued as stuck in the second generation of four generations of warfare. The eleven chapters of the book are written by 13 retired Pentagon insiders, retired military officers and defense specialists. The book is edited by Winslow T. Wheeler (photo at left), Director of CDI's Straus Military Reform Project. CDI has itself found a home in the World Security Institute. Wheeler worked for 31 years for U.S. Senators from both political parties and the Government Accountability Office. His earlier book, The Wastrels of Defense, was published by the U.S. Naval Institute Press. The book (a 2.3 meg pdf file) can be read for time being online at http://tinyurl.com/6ylwfw. I have been up most of the night reading it - it is fascinating. The scope of the first chapter by Lt. Col. John Sayers (U.S. Marine Corps, ret.) is global and deeply rooted in history. He observes that for most of human history wars have been fought in first-generation mode, with independently assembled military units engaged in close order drills. The Thirty Years War, largely a battle between Catholics and Protestants, led to the 1648 Treaty of Westphalia, which ushered in the era of the dominance of nation states. The second generation of warfare began at the end of the 19th century with the rivalry between Germany and Britain. The industrialized states were able to raise their firepower and support large battalions. This was the mode of battle of World War I, a war of attrition in Europe that was disastrous for all the combatants (the United States came late to the war and still lost 250,000 troops in Europe - while the major powers in Europe lost many more). Already at the end of World War I, with their forces depleted, the Germans were trying a third generation of warfare, decentralized and maneuverable. Sayers says that this approach was used by the Germans effectively in World War II and was imitated by the Chinese in Korea and by the Viet Cong. Nowadays, we are engaged largely in a fourth-generation war. With a loss of nation-state controls in many parts of the world, independent paramilitary groups have arisen, such as FARC in Colombia, or al Qaeda, or the Chechen rebels in Russia. Parts of Iraq are controlled by independent Sunni, Shiite and Kurdish forces. It's a reversion to the days before the Treaty of Westphalia. The independent groups behave the way SPECTRE does in the Ian Fleming novels - they have specific objectives and they fight to achieve them. Sayers says we should have moved a long time ago to third-generation and fourth-generation readiness - with smaller and more maneuverable forces. He does not think the large nations have any interest in another war of attrition of the size that the United States prepared for during the Cold War. - Budget gaming - frontloading and political engineering of weapons systems (Gordon Adams wrote about this 30 years ago in The Iron Triangle), with the result that the weapons are too big, too complex and unreliable. - U.S. military forces are led by officers who are inadequately trained to lead, contributing to tbe unpreparedness of the troops. - Defense costs rise faster than defense budgets and have become "ruinously expensive." Sayers ends the chapter describing the U.S. military creature as a "weak-muscled elephant that cannot even deal effectively with mice." The other ten chapters go on in the same vein, urging reassessment of the way that war-making decisions are made, the military personnel system, overdependence on foreign bases, lack of mobility of forces on sea and land, overdependence on technicians, excessive faith in the value of strategic bombing as opposed to air-to-air and close-support operations, misuse of the National Guard for overseas duty, excessive faith in technology and inadequate tracking of defense spending. Read the book! Here's the link again to the free online file while it works: http://tinyurl.com/6ylwfw. Nov. 15, 2008–Yesterday evening Economics Nobel Laureate Joseph Stiglitz painted a picture of today's dire economic straits with a broad brush, putting the burdens of the Iraq War in the middle and detailing the finer points of Bush-era economic failures around the sides. The canvas was made less miserable to observe by the fine food and wine served in the comfortable Upper East Side Manhattan home of Alan and Catherine Harper, at a fundraiser for Economists for Peace and Security (EPS). Joe Stiglitz is introduced by EPS Chair Jamie Galbraith. The room is full and buzzing. CityEconomist is in the first of three rows of chairs facing our speaker. Jamie, son of much-missed EPS leader John Kenneth Galbraith, is here from the University of Texas at Austin, and doesn't hesitate to acknowledge the grand contributions of some sons of Texas to the current financial fiasco. Certainly, the investment bankers in the Big Apple and mortgage hustlers in Orange County, Calif. couldn't have caused such mischief on such a world-wide scale by themselves. They needed Texan Phil Gramm and the Republican Senate to change the laws to make it all possible. Jamie agrees with me that the must-read story on the high point of the credit default swap hijinx is is the May 30 story in the Texas Observer. Send this link to anyone who still talks about the glories of financial innovation with a respectful demeanor (will some people never learn?). The judicial coup of December 2000 that installed Bush and Cheney brought back tax cuts for the wealthy, big increases in military spending, aggressive deregulation. Bush and Cheney placed lobbyists in charge of the regulators, representing, in every case, the most extreme anti-regulation perspective. This is the predator state. Jamie in his book argues that what began as a well-intentioned anti-regulatory movement deteriorated into crude anti-tax crony capitalism. He expresses delight that the nation has now elected someone who is mortgaged to nobody. He introduces Joe as someone with a unique record of insight and foresight about the dangers of ideological economic policies and the disasters they cause, and holds up a copy of Joe's new book, The Three Trillion Dollar War. Joe notes that a contributor to the high cost of the Iraq war is the high injury rate among returning soldiers - 15 injured soldiers for every one killed. Joe says that the U.S. government sometimes classifies an injury as an accident, as when a mine takes out a Humvee and then another Humvee plows into the first one. The injuries from the second event may be classified as an accident. The injured soldiers are adding $600 billion to the nation's unfunded liability and constitute a significant fraction of the war's cost - both economic and human. Joe describes the Iraq War as the first war that was financed entirely on a credit card. Oil was $23 a barrel when the war started, soared to above $145 in July, has now fallen to $57 a barrel today. Latin America borrowed money to pay for higher oil prices, resulting in credit starvation in the 1980s and "a lost decade of growth" How many lost years will the United States suffer from our recent credit binge? 1. The stimulus and bailout were both misconceived. Most of the stimulus package was used to pay down debt and didn't do much for consumption. Allen Sinai presented a paper projecting the worst downturn since the Great Depression and 8-12 percent unemployment. The bailout amounted to cash for trash, whereas the Brits did it differently and better, with conditions and sanctions. The bailout money has been spent on bonuses and dividends. 2. Financial regulation has failed. The financial boats have holes, their steering is gone and their pilots are drunk. 3. The budget has been mismanaged. A deficit can be a good idea if it is spent on something useful, like roads and technology, which have high returns. Using taxpayers' money to buy toxic assets is not a good use of money. We can evaluate public spending from a long-term and a short-term perspective. Our military spending has been poor managed on both counts. We have been buying less security for more money instead of the reverse. The $700 billion commitment of the Troubled Assets Relief Program (TARP aka Bailout) amounts, says Joe, to ten years' worth of global foreign aid. Treasury Secretary Paulson seems to have seen the light and is halting the purchase of the toxic assets, following Gordon Brown's path of buying bank equity [see Telegraph story today]. Summing up, Joe says the United States has been kept going since 1993 by the tech bubble and then the housing bubble and now some improvement in exports. What we have to look forward to is perhaps two years more recession and then a continuing period of slow growth, maybe focused on renewable energy, green jobs. Note on EPS: CityEconomist is proud that so many good groups owe their existence to New Yorkers. One of them is EPS, which sponsors economic discussions and reports about unnecessary wars and wasteful military contracts. It was founded by the late Bob Schwartz, an economist and investment adviser whose years as a Marine (he never liked being called an ex-Marine - once a Marine, always a Marine, he said proudly) led him to champion the cause of peace. I was Bob's first paid-up member in the late 1980s and followed him as the second EPS Treasurer. Alan Harper is the third. EPS Executive Director Thea Harvey has made a major contribution to bringing EPS to its current thriving condition. Legacies from Bob Eisner and Bob Schwartz have been major factors in the organization's endurance. BRANDING | Will Obama Skill Rub Off on USA? Will the American brand improve under President-Elect Obama? AdAge is running a poll right now. Positive responses are sweeping the field. And why not? We know Obama is tremendously popular overseas. He's a citizen of the world. Country second. Political expediency first. Strategic rigor about 18th. My friends, what a terrible campaign. John McCain lost the election for many reasons: Bush's failed presidency, the economy, the Wall Street meltdown at the most inopportune time, the disastrous bet on towering ignoramus Sarah Palin, and not least the lavishly financed, nearly flawless campaign by his opponent, already a singular figure in American political history. Still, strategically and executionally, it was not merely a disaster; it was an embarrassment -- whatever "it" was, because "it" was a moving target. Over the course of two months, McCain's marketing messages were, variously: 1) Country first. 2) Maverick. 3) Don't listen to those ridiculous, un-American, liberal, intellectual, coastal elites. 4) Barack Obama is a superficial celebrity. 5) Tested. 6) Change. 7) Obama is a dangerous unknown quantity. 8) Obama is a socialist. He should have stopped after No. 2, exactly as Obama never stopped talking about the economy, health care and education over and over and over and over no matter what flak the Republicans were shooting in his direction. He was relentless, McCain was reactive. McCain’s agency was Foxhole Productions in Arlington, Va. Thanks to Congressional Quarterly for noting today ("Obama’s Operation May Become the Model of Fundraising") the comments of former Federal Election Commission Chairman Bradley A. Smith in a Washington Post op-ed piece a week before the election. Brad Smith was commenting on the fact that the campaigns of both Barack Obama and John McCain had exceeded $800 million in combined spending two weeks before Election Day. The CQ story emphasizes that "It’s not just the amount of money that was spent but also the way it was raised — much of it online, in small chunks and, in Obama’s case, completely independent of the public financing system for the first time in the post-Watergate era." Smith is overtly partisan - he was a Republican appointee. The online discussion of Obama's citizen "juggernaut" is all the more interesting. He thinks the system has worked, even though his candidate was losing. Here are some excerpts. Arlington, Va.: Just to counter some of the paranoid posts -- I'm one of those small donors that you fear so much. In <> early September I became so disgusted with the McCain/Palin campaign that I went to Obama's Web site and made a donation. I since have made two additional donations. All three were responses to something that was said by the McCain/Palin campaign. In all I've given less than $100. I was born in the U.S. and have lived here all my life, and despite various Republican's claims I'm not a communist or anti-American. I'm just a regular person who has every right to vote and to support a candidate with my time and money. Bradley A. Smith: I wish more people thought like you -- not your support for Obama ;-), but regarding your motives for supporting Obama and your willingness to back up your beliefs. Reston, Va.: McCain keeps saying that Obama is trying to buy the election. Isn't it more like the citizens are? They're the ones contributing the money. Bradley A. Smith: Right on! Wilmington, N.C.: "Former FEC chairman." Given your obvious political leanings, I must say I find that very disturbing. Is that a partisan political post? Should it be? Bradley A. Smith: The FEC has six commissioners, with no more than three from any one political party. Four votes are needed for most action. So one party can't dictate outcomes. I found that the Commission worked pretty well. But you've really hit the nail on the head -- how can you maintain over time a truly unbiased political police? That's why I generally would deregulate the system, or at least start in that direction. We need separation of campaigns and state, you might say. Maryland: The other day a friend and I were having a friendly argument. He was saying there should be more rules to limit how much a campaign can spend because $200 million is outrageous. I said "$200 million is rock-bottom cheap for a good presidential administration!" It's just a fifth of a billion dollars -- compare that to the cost of the Iraq war. Just saying. Bradley A. Smith: You are right. Political spending needs to be kept in perspective. Americans will spend about $12 billion on potato chips this cycle. Coca-Cola will spend more on advertising this year than will be spent by all the candidates who have run for president combined. Auto makers will spend more than twice as much this year advertising cars as all political spending for federal office. It cost money to communicate, whether you are talking about cars, cola or politicians. On October 6, I posted on Huffington Post an analysis from my friend Patt Cottingham that impressed me. She limned seven cogent reasons why the Obama brand was better than McCain's. See Brand Expert Scores Obama v. McCain 7 Ways. Now Obama has been elected President and AdAge announces today that November 4, 2008 is the biggest day for marketing in universal history. President-Elect Obama's "Change" theme gets this all-time cosmic award. Here's the picture (as if you need to see another) and what AdAge had to say about it. Take a relatively unknown man. Younger than all of his opponents. Black. With a bad-sounding name. Consider his first opponent: the best-known woman in America, connected to one of the most successful politicians in history. Then consider his second opponent: a well-known war hero with a long, distinguished record as a U.S. senator. 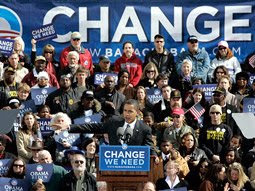 Obama owns the 'change' idea in voters' minds. It didn't matter. Barack Obama had a better marketing strategy than either of them. Barack Obama used "Change" as the "big truth." If you tell the truth often enough and keep repeating it, the truth gets bigger and bigger, creating an aura of legitimacy and authenticity. Hillary Clinton first tried "experience." When she saw the progress Mr. Obama was making, she shifted to "Countdown to change." Then when the critics pointed out her me-too approach, she shifted to "Solutions for America." What word is associated with Ms. Clinton today? I don't know, do you? Nov. 2, 2008–The NYC Marathon today is going to produce 130 tons of waste. This year the NY Road Runners Club is recycling the gallon jugs used for dispensing water. They didn't used to, and the jugs were thrown out with NYC's waste. The Road Runners are looking into charging runners a license fee to be auctioned off the way seat-license fees are auctioned off by the Jets. If the runners are willing to pay such a fee, some part of the revenue should be allocated to making the NYC Marathon a model of waste reduction and recycling. Although some Asian (Singapore, Hong Kong) marathons have had environmental themes, marathons in many cities have been slow to embrace environmentally friendly practices. The NYC Marathon might have its recycling etc. practices third-party certified against an environmental standard. The Rainforest Alliance in NYC has been involved with standard-setting and certification and could help.